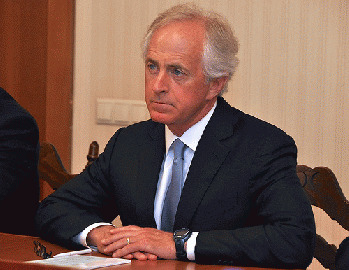 Corker: virtually all Senate Republicans know Trump is a liability. Impeachment coming? "Mr. Trump poses such an acute risk, the senator said, that a coterie of senior administration officials must protect him from his own instincts. 'I know for a fact that every single day at the White House, it's a situation of trying to contain him,' Mr. Corker said in a telephone interview." "'Look, except for a few people, the vast majority of our caucus understands what we're dealing with here,' he said, adding that 'of course they understand the volatility that we're dealing with and the tremendous amount of work that it takes by people around him to keep him in the middle of the road.'" "'As long as there are people like that around him who are able to talk him down when he gets spun up, you know, calm him down and continue to work with him before a decision gets made, I think we'll be fine,' he said." Meaning, of course, that if Trump fires them all for having the temerity to calm him down, we're screwed. My knee-jerk reaction to the whole story was "WTF ARE YOU CRAVEN BASTARDS DOING CONTINUING TO EXPOSE YOUR NATION AND THE WORLD TO SUCH DANGER, WHEN YOU COULD IMPEACH?" But then I thought -- and my glasses may be a little rosy here, but -- perhaps this is the beginning.